The Pittsburgh Business Times helped introduce the newest AlphaLab cohort earlier this month, and many of you were able to meet the founders at our Open House in February. So, we wanted to take some time to share our insights on what we think makes this cohort unique. What stands out most about this cohort is that each company is tapping into market trends and shifts which create an opportunity. Each of the founders brings domain and functional experience to their teams, and all of the companies have products you can buy or use now. As a group, after little over two months together, they have already embodied the AlphaLab and Pittsburgh spirit of helping and cheering each other on. We are excited about the potential of these companies and share our perspective on each one below. Symmetric Health Solutions is improving the healthcare systems’ bottom line and increasing patient safety. Potential: The healthcare industry recently enacted a new regulation, GUDID (Global Unique Device Identifier Database administered by the FDA), that requires medical devices to have unique identifiers, creating a unique opportunity for supply chain visibility. Symmetric Health is enabling this visibility with its unique data library that helps hospitals understand its purchasing volume, identify substitutes — which leads to bottom line cost savings and even more important, addresses the backorder issue (of an out of supply item) which creates delays in hospital operations. The team, all graduates of CMU, have backgrounds in healthcare supply chain and the company is piloting with a major hospital on its solution. Subtl Beauty, the direct-to-consumer cosmetics brand, provides women with more flexibility in their makeup routine through innovative packaging design. Potential: Another major lifestyle shift is the trend among women to be “on the go” and as a result, convenience and accessibility are critical to any products and services. Subtl Beauty is addressing the $540B beauty industry with a brand and unique product that brings the industry into the 21st century. Rachel Reid, CEO, grew up in the skincare space and has spent the past several years leading projects in eCommerce and digital marketing. Build your makeup stack today at Subtlbeauty.com. Sheepy helps insomniacs sleep better through daily check-ins that teach research-based techniques. Potential: We have seen the increasing popularities of apps and chat-based interfaces as a way to engage users, including helping them in areas of meditation (Headspace). Applying this paradigm to insomnia provides an exciting opportunity as around 1 in 3 people suffer from some form of sleep deprivation and increasingly, users are turning to their phones as a trusted companion. Before building Sheepy, the Founder was working at a teletherapy startup. You can sign up to test the beta here at trysheepy.com. Martris, LLC designs and builds software that improves interpersonal interactions and relationships. Potential: Continuing on the theme of how apps are helping us with more complex offline interactions, Martris is developing “software for soft skills.” Its first application, Conflict Coach, helps guide users to manage conflict, taking the expertise of its co-founder, Martha Harty to ease anxiety and coach someone on having that tough conversation. In a world where change is constant and conflicts are inevitable, software that helps companies and employees with managing conflict is increasingly needed. You can test the web application at Conflictcoachapp.com. Gender Reveal Game allows expecting moms to raise money with their gender reveal by having friends and family guess the baby’s gender with cash plays. Potential: Another major trend is the popularity of Gender Reveal as part of the baby announcement process for parents. Gender Reveal Game is creating a way for parents to involve their networks in a fun game to guess the gender of their baby while providing cash gifts to the expectant parents. By creating a new way to engage the expecting parents (and their networks) earlier, Gender Reveal Game has the opportunity to build the earliest relationship with parents. The Founder is a Mom with over 10 years of experience in Public Relations. The game is live and available at Genderrevealgame.com. Gender Reveal has recently partnered with Healthy Start Pittsburgh on a game to guess the Royal Baby’s gender, you can play along at genderrevealgame.com/game. CompleteBankData is a real-time competitive intelligence platform for bankers. Their analytics can be used to find opportunities in the market, either by proactively taking advantage of market dynamics or by discovering potential borrowers that uniquely fit to a bank’s lending model. Potential: Many industries are being transformed by precise analytics that drive marketing and customer acquisition decisions, CompleteBankData is doing the same for the commercial lending market. By combining more than a dozen sources of data CBD can uncover opportunities that banks don’t have the ability to know about today. CBD offers banks a unique view into their market and competitors including lending market share info, total lending opportunity, analytics on loans and potential customers in need of financing. The team is headed by Nate Tobik, an industry expert on banking and author of The Bank Investors Handbook, has been a featured on Bloomberg, Forbes, Benzinga, NPR, and other financial media. You can learn more at Completebankdata.com. Learn more about the AlphaLab program at alphalab.org. 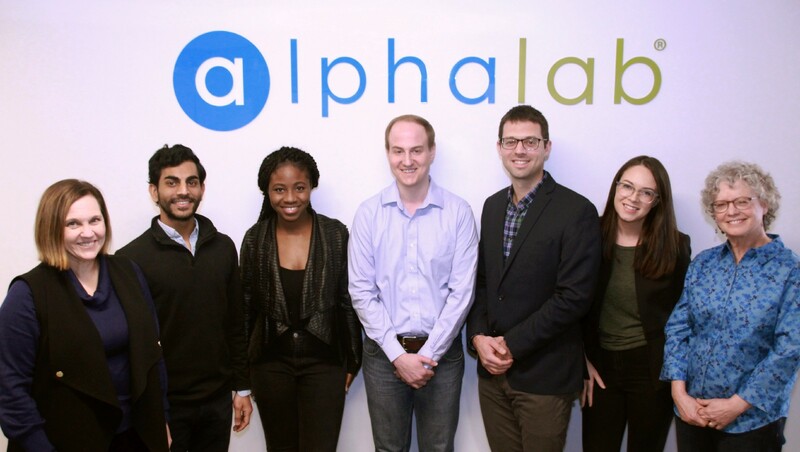 AlphaLab is a nationally ranked early stage startup accelerator focused on helping founders achieve product-market fit and customer traction. Posts from experts at Innovation Works.